RESORT LIVING at its FINEST! Impeccable home located in the Award Winning Active Adult community of Province! Gorgeous Front Courtyard and Amazing Backyard on Greenbelt with Built in BBQ, Gas Fire Pit and Extended Paver Patio with Custom Lighting, Gas Tiki Torches and MORE! Meritage Solar Home with Spray Foam Insulation and all the latest and greatest Energy Efficiencies! No need to wait for a New build! This home is INCREDIBLE and is a MUST SEE. Gorgeous Kitchen with Gas Range Stainless Steel Appliances (just purchased in 2017 with a 5 year transferable warranty). Spice Maple Cabinets with a 2'' Crown Molding and Pull Outs, Granite Countertops, and a Walk in Pantry. 2 1/2 Car Garage for Additional Storage, 16'' Tile Throughout the ENTIRE home including the Den with carpet only in the Master Suite and Guest Bedroom. Raised Vanity Heights in all Bathrooms with Luxury Raised Toilets. Master Suite has Bay Window and Walk In Closet. Master Bath includes a Walk in Shower with Seat. LED lighting throughout the Entire Home. 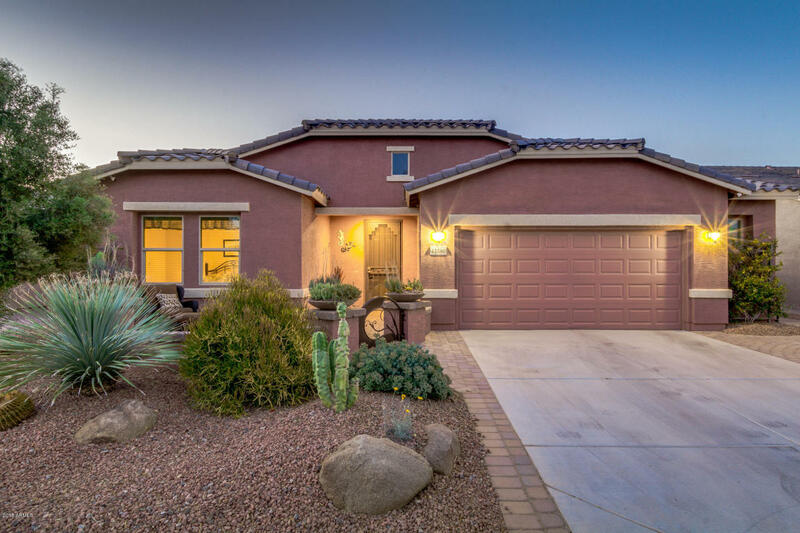 Custom Interior Paint, 8' Custom French doors at the Den, Ceiling Fans in all Bedrooms, Den, Great Room and Covered Patio. Soft Water System and RO System Included along with all Appliances including Fridge, Washer and Dryer. Backyard landscaping includes LED lighting (check out the custom wrought iron plant/light in back of gas grill). Exterior of home repainted in 2017. Upgraded lighting throughout the home. 2" Wood Faux Blinds, Laundry tub in Garage and White Cabinets above the Washer and Dryer. Insulated Garage Door, Solar Hot Water Heater, Built in Seating at Fire pit for 10 people. Security Doors on both the front and patio door. Paver walk way to side of home to screened in enclosure for garbage cans. All irrigation replaced with PVC pipe. This home is move in ready! Start Living the GOOD LIFE!